September week3: Rajanbhai finds faults in Jan Dhan scheme while speaking in a seminar. Taking cue from him, all the columnists have jumped in a competition – who can criticize this scheme more? 50% Of the bank accounts are not operated at all. Most probably those accounts opened part of MNREGA and other campaigns. 3.3 lakh Villages have Banking Correspondent Agents (BCA) . But this model is epicfail, we’ll see it further in this article. 34% is the average loan interest charged by local money lenders. 55% Of Rural Dalit families have to borrow money from local moneylenders / Shroffs. Is the average loan-interest rate charged by Private microfinance institutions (MFIs). by 2010, Microfinance agents even started ‘goondagiri’ to recover loan money, and this model began to decline. It doesn’t mean Government and RBI haven’t nothing. Since independence, they have launched many initiatives for financial inclusion- Bank Nationalization, Regional Rural banks, cooperative banks, Banking correspondence agent, Swabhiman, Swavlamban, Microfinance, No-frills account, 25% rural branch rule, Bharatiya Mahila Bank and so on. Target Open bank accounts for 7.5 crore families in one year. Each household will have a banking outlet within 5 km distance. Each household will have atleast one bank account. Even minors of 10 years and above age, can open. 1 family, husband-wife separate accounts= each gets 1 lakh cover. If you open account before 26th January 2015, you’ll get additional Rs.30,000 life insurance cover. 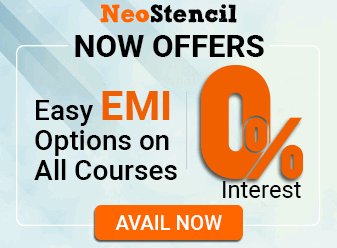 If your good credit history for first 6 months=>Rs.5,000 overdraft facility. If same family has multiple accounts then only 1 account gets this benefit- first preference to woman’s account. 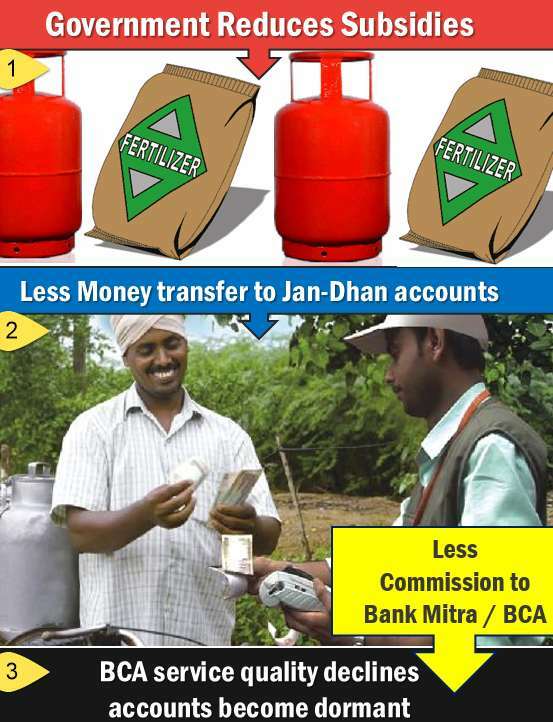 3.Literacy Financial literacy programmes to make juntaa aware of benefits of saving and investing money properly. 5.Insurance If JDY account holder is interested, he can buy micro insurance product. Earlier Government launched Swavalamban Yojana to make unorgnized sector workers join NPS scheme. Those people will get NPS-pension directly in these Jan-Dhan accounts. Government will also try for direct benefit transfer (DBT) i.e. sending scheme-subsidy money directly to beneficiaries’ jan-dhan accounts. How to open Jan Dhan account? if you already have a bank account, no need to apply again. Just get a “ruPay” debit card, and you get automatically enrolled into this system. Jan Dhan accounts are put under Core Banking solution (CBS) platform, therefore it can be transferred from one branch to another, as per your request. if you don’t have any account, open a new account with any one of the following documents: Aadhar Voters card, Driving licenses, PAN, Passport etc. If a person doesn’t have any official documents, still bank can open its account- with just his photo and signature. cannot withdraw more than 10,000 rupees per month. Valid for 12 month only. Will aid financial inclusion, will rescue villagers from the clutches of evil money lenders. You can cite those ‘disturbing numbers’ to justify your “pro” stand in the group discussion (GD) when other candidates (brainwashed by theHindu) try to create fish market in GD by criticizing everything under the sun. Could boost household savings rate similar to Bank Nationalization in 1960s. Direct Benefit transfer (DBT) money will flow into those accounts (and from there again as “loans” to other needy people.) Thus savings will turn into capital. Subsidy leakage will decline. 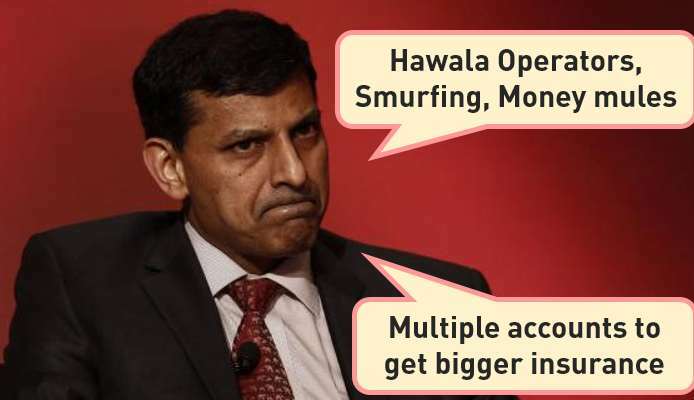 Overdraft only after monitoring performance => win-win, rare chances of NPA/defaults. Jan Dhan scheme gives Rs. 1 lakh insurance on each account. To get large insurance or overdraft facility, same person might open multiple accounts in multiple banks- one with Aadhar card, one with PAN card, one with voters card. Sarkaari banks may also overlook nuisance, in order to meet their ‘targets’. Recall the earlier article on PJ Nayak Committee. Since Government is the majority shareholder in sakaari banks=> Chairman and board of directors have pressure from Government => they pressurize bank staffs to enroll maximum bank accounts so that Modi can brag about it during his Madison square speech. RBI suggestion: banks should establish a single information sharing system to weed out such multiple accounts. Counter argument: State bank of India has made clear guidelines that even if multiple accounts of same person, he will get only 1 lakh cover. And since all accounts are put under Core banking solution (CBS) platform = duplication / mischief unlikely. Rajanbhai is also worried that JDY accounts could be used for money laundering and Hawala operations. Then send money overseas without coming under the watchful eyes of Income tax or Enforcement directorate. Just like those “Drug mules” who ingest condom packed with narcotic drugs and deliver it to other country via airplanes. Money mules= individuals with JDY accounts, who facilitate Hawala operators to send money via their account. Jan Dhan gives you free accident insurance cover worth Rs.1 lakh. But there is a secret condition- you must use RuPay debit card atleast once every 45 days. This is not be possible for poor families in remote tribal areas. So, they’ll lose the benefit due to inactivity. Because insurance money doesn’t fall from sky. Even if you’re getting it for free, still someone has to pay the premium, right? In this case, Modi is not paying the premium. (Because he wants to keep fiscal deficit low). Your premium is paid by NPCI. 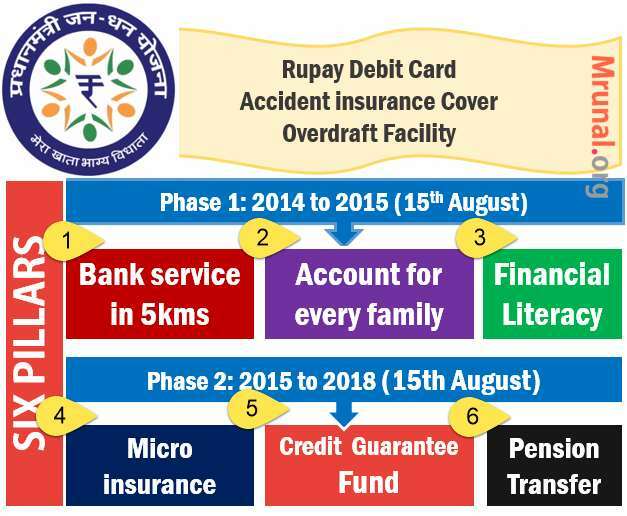 National Payments Corporation of India owns the rupay card system. Therefore, they want you to frequently use the card. Within those SSA, each household will have a banking outlet within 5 km distance. Since banks cannot open branches everywhere, Government aims to achieve this target via Banking Business Correspondence Agents (BCA) or Bank Mitra. What’re the Problem with BCA model? They get 2% commission on each transaction. Monthly income ~2000 rupees. For opening new account, they ask separate 100 rupees as ‘service charge’ (although no bank or RBI has authorized such payment). For loan processing too, they demand separate commission, outside bank’s knowledge. Jan-Dhan relies on the failed BC model=> Jan dhan will fail as well. Aadhaar project is yet to cover all residents. Aadhar project facing court cases, because UIDAI is not a statutory body, backed by any law. UPA Government had to admit in court that “Aadhar-number” is not compulsory get Sarkaari-scheme benefits=> Juntaa won’t be motivated to get Aadhar cards=> Jan Dhan will have trouble transferring money. AT BCA level, Biometric authentication (finger scan) = showing 25-30% errors. So citizens will have difficulty in withdrawing money even if they’ve Aadhar card. Dot-B DBT will fail = junta won’t get much money in Jan-Dhan accounts and there are fingerprint problem=less transactions. Prime Minister Modi believes in free-market economy and minimum governance. Similarly state governments too, will reduce their subsidy burden to comply with FRBM act. Gradually, less subsidies on food, fertilizer and fuel. So, even if DBT works fine, juntaa won’t get much money in their accounts =less transaction= less commission to Bank Mitra. Join Dots A+B+C = BCA (Bank Mitra / Banking correspondence agent) will get very low commission, he’ll lose interest and service quality will declining- just like those coaching wallas, who don’t finish syllabus if batch strength is low. Bad customer experience= People can’t use Ru-pay cards every 45 days = insurance protection also gone = further negative experience = Jan Dhan accounts will become dormant. Households will again resume saving money in gold or wasting on desi liquor. JDY is just old wine (no frills account) in new bottle (Jan Dhan Account). when earlier scheme didnot improve financial inclusion, there is no chance, new one will succeed. Systematic and well planned reforms necessary- as recommended by Nachiket Mor Committee- payment banks, wholesale banks, UEBA etc. But Government is in haste to capture media attention. Rural incomes will improve because of other Government schemes- skill India, make in India etc. So, People will use bank accounts, even if Government gives them no subsidies / DBT / MNREGA. With penetration of mobile, internet banking and digital literacy, people will be able to make transactions online. BCA will become irrelevant. Therefore, even if Aadhar card, DBT or BCA model fails, it is not necessary that Jan Dhan will automatically fail. On which day was JDY launched? How many accounts will be opened in one year? What is the motto of this scheme etc. In CSAT-2015: they’ll give you a few statements about JDY’s salient features. You’ll have to find correct of them. Only 1 and 2; only 1, 2 and 4….and so on. Discuss the initiatives taken since the independence, for the financial inclusion of rural families. Enumerate the salient features and benefits of PMJDY. Interview/ GD: PMJDY- pro and anti-arguments. And what steps should be taken to ensure its success. I can’t understand this scheme…. sir,I am one of the bank mitra of UNITED BANK OF INDIA (west bengal).As a bank mitra I am getting just 3000 salary per month it’s more difficalt to alive in this days for not only me but also for all bank mitra of india.so I request to the government of india to increase our salary. My information bank mitra fiex salery. My Acount is in Jan Dan bank but not getting any message in my registered phone number . why ?